A three day weekend seemed plenty of time to see Budapest. 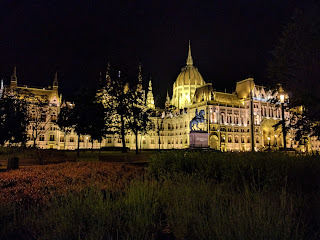 We arrived in Budapest at midday on a Saturday and left the city early evening on the following Monday feeling we were comfortably relaxed yet having gone around the city. 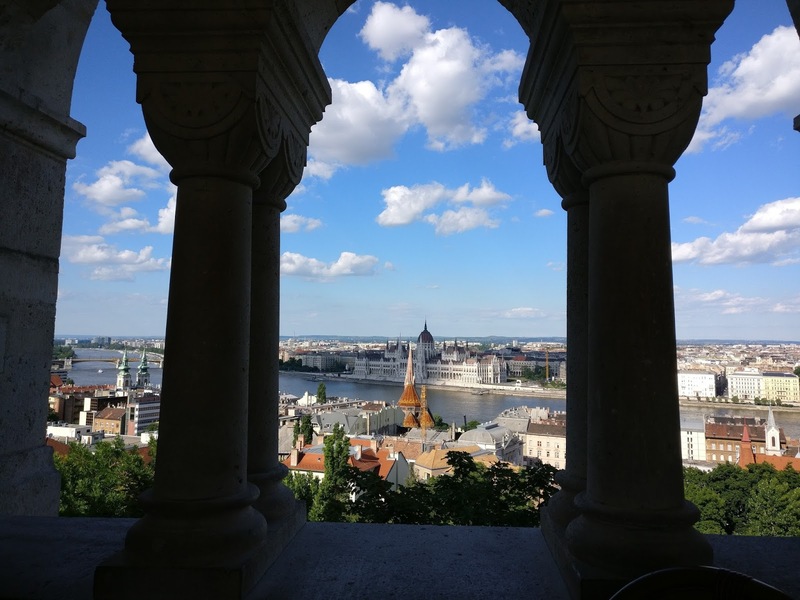 As most of you know, Budapest is actually two cities. 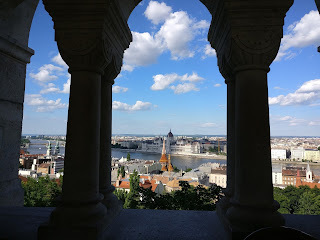 Buda is hilly and green with a castle, a citadel, nice viewpoints and a statue. Pest is the hustling bustling city. We stayed in Pest close to the parliament. As I said, we arrived at midday so we headed almost directly (thanks to our flight delay of an hour) to a free walking tour of the city. There were easily over a hundred people at the meeting point looking for the tour. I'd never seen so many people on a walking tour. K who has been Budapest in 2010 claims he couldn't even find a tour company that offers this and instead found a history professor who agreed to take five of them around. Thankfully though, the tour group was split five ways but we were still about 30 so it was still too large a group. Also, although it was a nice Sunday day of 26/27 degrees it quickly became apparent that it's not so nice when it's too sunny when you are out on a walk for three hours during the hottest part of the day. Enough of complaining. 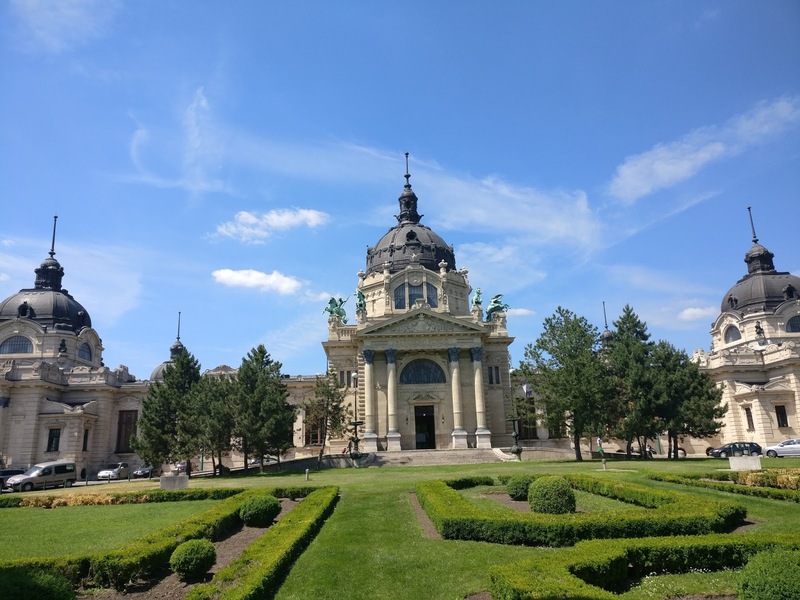 The tour started in Pest and we realised that much of the city was destroyed multiple times and what we see now are new buildings despite of the fact that they were rebuilt to the original exteriors. A little history for you. 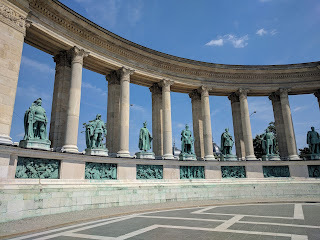 The country that is Hungary was occupied by some tribes sometimes referred to as the ungurs in old texts and some references to the Huns from the east. The country came together under King St Stephens combining some tribes, predominantly the tribe of Magyar. 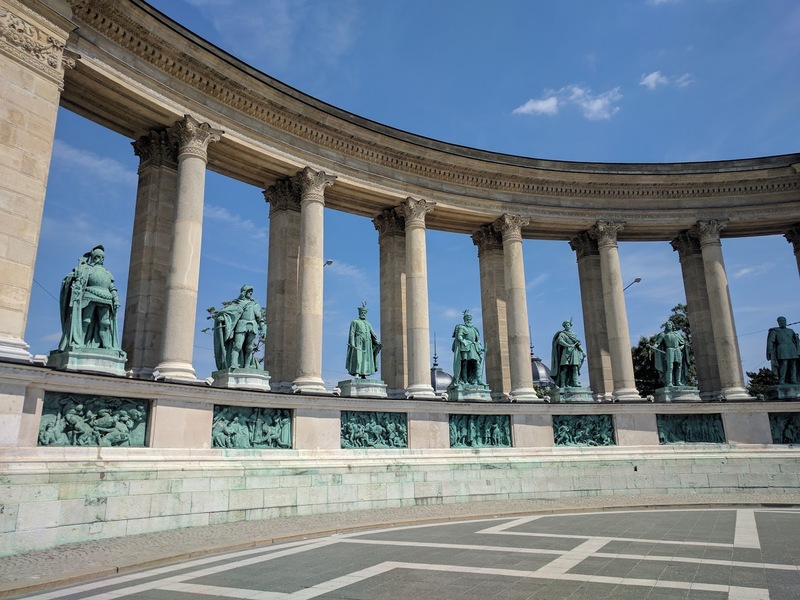 They fought with the Romans and the Turks over the years and ultimately created the mighty empire of Austria-Hungary with its vast expanse of land. However, they lost more than 2/3rds of this in the First World War. Soon after they were yet again stuck between a rock and a hard place, quite literally between the Soviet and the Nazis. They sided with the Nazis when Hitler promised them their lost lands but at the cost of the Jewish population. After Buda stood against the Soviet and was destroyed, the end of the Second World War led to four decades of Soviet rule. 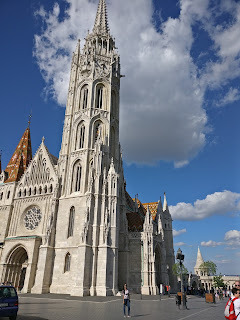 The tour took us around St Stephens' cathedral named after the king, took us around some of the lime stone structures that still bear small amount of destruction when the Nazi spies and the Red Army fought running on roof tops like in the movies. 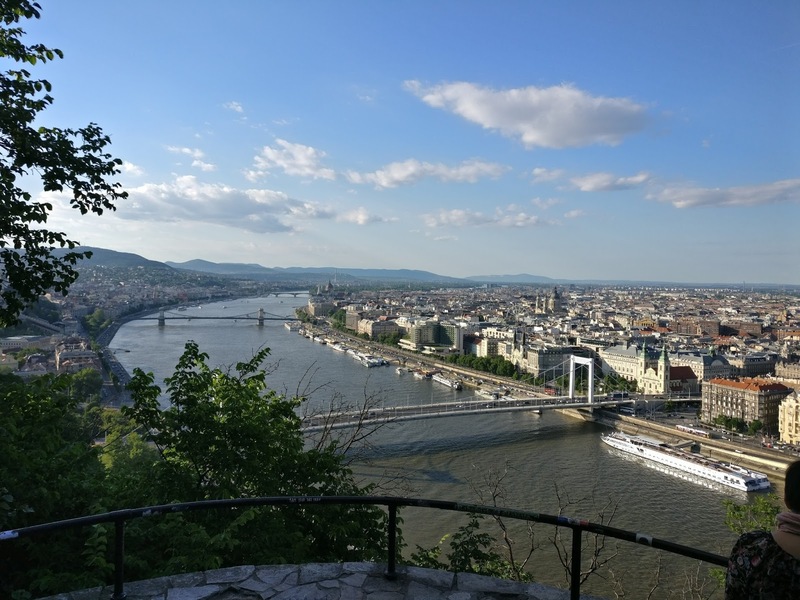 The tour continued on the chain bridge (which was also twice destroyed but reconstructed to its original design) to Buda to see the place where Hungarians stood against the Soviet and lost. 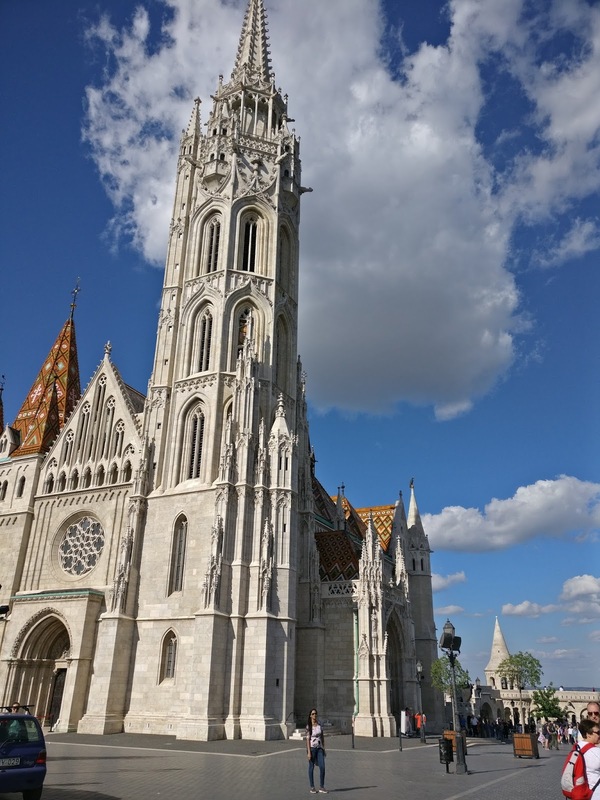 We then walked​ up to Matthias church and ended at the view behind the church. K and I followed that with yet another climb up Gellert Hill to the citadel and the statute of Lady Liberty. The statue was originally put up praising the Soviet for liberating Hungary from Germany. But after public sentiment against the Soviet grew sour, the inscription was changed to just symbolise liberty and freedom. We then walked our way back to Pest across the another bridge. At night we tried to go to some fancy Hungarian restaurants but they were booked up well in advance so we ended up going to <> Square in the Jewish District and ate at Menza which was also a nice Hungarian place. After that we caught up with some friends at this place called Instant. 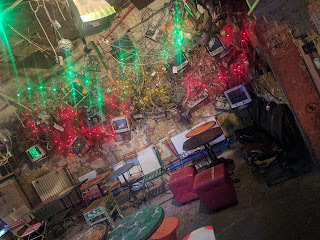 Budapest has a new phenomenon that they call ruinpubs. There were some large buildings in the Jewish District that were in ruins and cost too much to restore that the government basically gave up on them, ignoring them. Some young people began reclaiming these unused buildings filling them up with knick knacks and before you know it, they became artisty hipster places to hang out at day and night. So this place called Instant, we read about as being the biggest wth 27 rooms apart from the open courtyard area. It was a bit too large I think, to fill it up with random objects so most of the rooms were just empty with some themed faded wallpaper and chairs. As we were leaving though, we realised the place was getting really packed. The next day, Sunday, we decided to go to one museum (because museums are closed on Mondays). After a lot of thinking, we decided to visit the House of Terror. 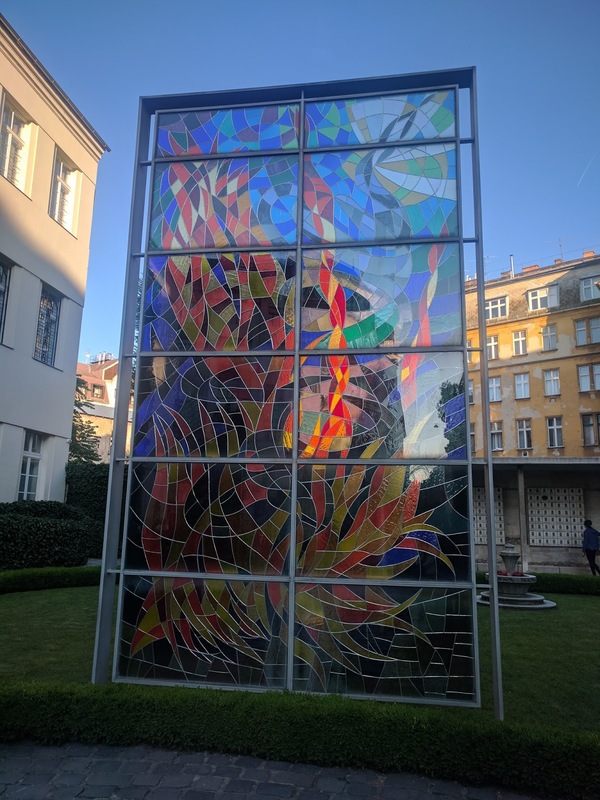 This was the headquarters of the Arrow Cross Party which was the Hungarian party allied with the Nazis and then became the headquarters of the Communists during the Soviet rule - much like the Topography of Terror in Berlin. 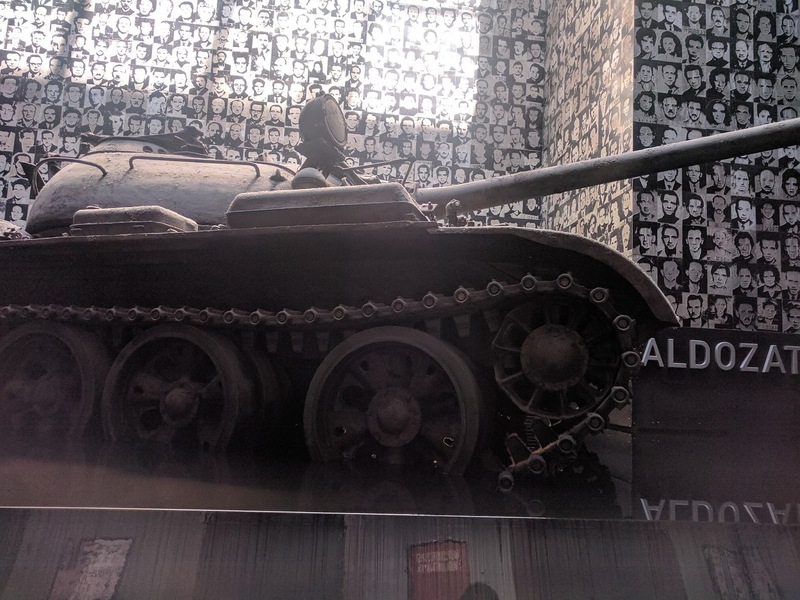 The museum starts with the Arrow Cross coming to power and then pushed aside by the Nazis who cause more atrocities and then the "changing of clothes" happens where the nation that did the dirty work for Hitler changes uniform and does it for Stalin. Then there is the 1956 uprising against the Communists but the might of the Soviet comes down on them and crushes them. 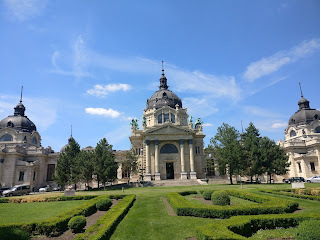 And then towards the end of the museum, they don't explain how Hungary became independent but there is a large display of the photographs and names of the victimizers. 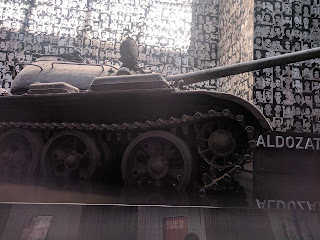 That display struck me as odd but I would know later on a tour that the people of Hungary feel that those who committed the atrocities were Hungarians under both the regimes and these people did not face enough punishment. The museum is rather new and was built by the current PM Victor Orban and his party. It has received criticism for showcasing Hungary as a victim even though there were numerous Hungarians that perpetuated the Nazi as well as the Red Army cause. So Sunday turned out to be a rather grim day because after visiting the museum, we chose to do a Jewish quarter walking tour. Our tour guide was witty so the longish tour seemed shorter. We walked to the Jewish quarter and discussed how when the Jewish came to Hungary in three waves, as and when there were disturbances in the Middle East and eventually when the synagogue in Jerusalem fell for the third time. The Jews settled right outside the then city boundary of Pest in order to trade with the city. They were foreigners and not allowed to own land. 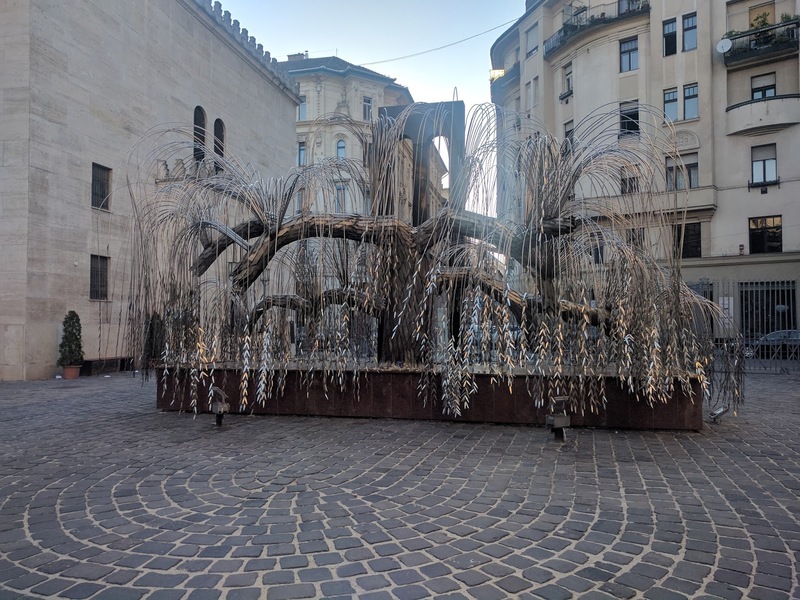 However as the trade flourished they got integrated, especially with the creation of the new sect of neo liberal Jews who bore a Hungarian identity and before the second world war, they made up a quarter of the population of Budapest. Today they make up about 2%. The Jewish District is home to the Great Synagogue which was until recently the largest synagogue in the world (now there is a bigger one in NYC). This synagogue and the parts of the Jewish District were a ghetto during the short Nazi occupation. The Jews in the city were protected for most part of the war while outside in the countryside, they were almost completely removed. Within the city, the protection lasted till the Nazis walked in only 9 months before the end of war and created the ghettos. Our tour guide showed us a photograph of the garden in the synagogue that was filled with mounds of bodies which was how the Red Army found them when they were liberated. The tour then took a cheerful turn when the guide starting talking about how the artists have been taking over the ruined buildings to create these hipster ruinpubs which are all in the Jewish District. The tour ended at Szimpla which is the most touristy of them all but with very interesting decor. Following the tour, we went into the Great Synagogue which was the first time I had stepped into a synagogue. This particular one was designed to resemble a church with its altar and a neo Gothic and some moorish influences in architecture. It was meant to show that the people are willing to integrate into existing society. I also learnt that the mark of a synagogue was the ten commandments on display and that kosher meant a way of eating that segregates dairy from meat. We also visited the garden in the aforementioned photograph and I saw the same photograph, except this time I was standing from where it was taken and it's chilling when you look at the garden and suddenly be able to imagine the 3000 bodies in heaps. Usually, a synagogue doesn't have a cemetery. Our synagogue tour guide himself was unaware of his religion until he was a teenager when his family felt safe enough to reveal to him how they burnt their documents in order to avoid being marked as Jewish. Continuing on the Jewish theme, we had dinner at Yiddishe Mamma Mia. But it was mostly Italian food. After that we went to see Csendes, a local ruinpub recommended by walking tour guide but it was a tad too local in the sense it was empty on a Sunday night. 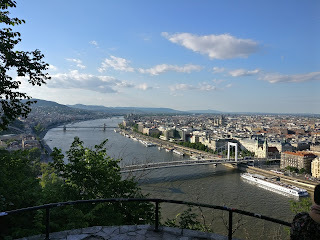 On our last day in Budapest, we woke up and dragged ourselves all the way with changes from metro to tram to bus to the edge of Buda to take a ride on the chair car. Sadly, it was closed for renovations. 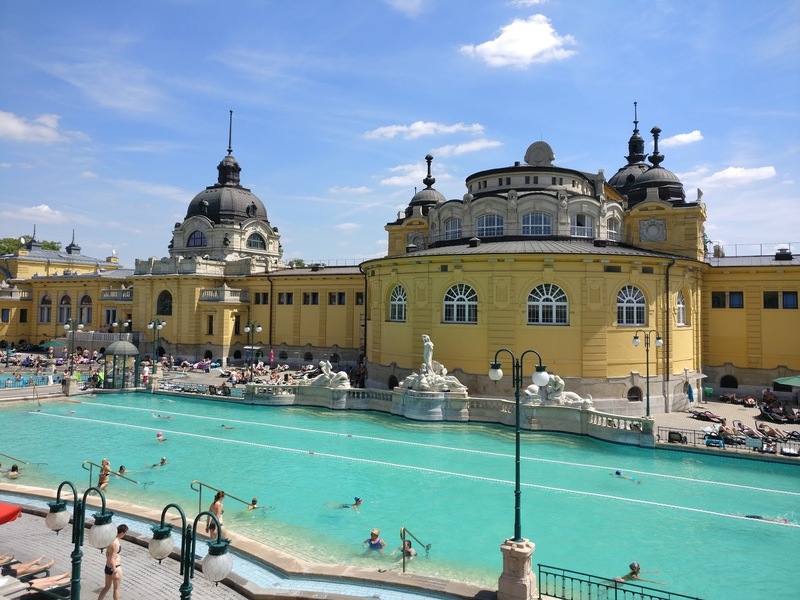 We then decided to go to one of the famous baths of Budapest, Scheszny. The city has some natural geothermal springs whose water is rich in minerals and can have therapeutic benefits. 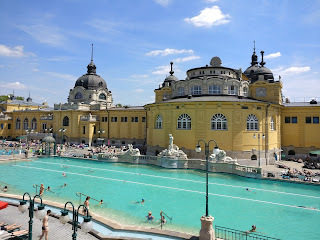 We went to Scheszny but we didn't pack any swimwear (and swimwear there was some €80 which is ridiculously expensive considering this was Budapest). They do have a short tour around the place so we walked around a little bit and saw the open pool. Apparently the water comes to the surface at 70 degrees and has to then be cooled to about 38 degrees before it is let into the pool for use. In winter when it's snowing, it must be amazing with the steam riding from the pool. We then made our way to the opposite entrance of the bath because it was really beautiful. We also got ourselves a half litre of the mineral water that is drinkable. However it tasted horrible because of the sulphur and was really hot on a really hot day. On our way back, we stopped at the Heroes Square nearby where we happen to see some VIP pay homage to the soldiers who died in all the wars. We went back to our airbnb to pack and leave but found out flight was delayed by an hour so we took the river bus along the river bank before we went to the airport.